TDmonthly - Race to TMI Toymarketing to see NEW Racing Rody! Race to TMI Toymarketing to see NEW Racing Rody! Rody horses, a bouncy ride-on toy from TMI Toymarketing Intl, Inc., have been a favorite in specialty toy stores for years. We spoke with the company to learn more about their products, and what they have in store for 2013. You can see their line in person at NY Toy Fair Booth# 927 & 1028, and they will also be showing at ToyFest West Booth# 500 - 513 & 600 – 613. "We have been in business since 1984, and we work with Ledraplastic spa, Italy (Gymnic Line), importing and distributing its superior line of Rody Horses, Hop Balls, Fitness, Therapy and Wellness products for balance and coordination development for children and adults. Their products are made of heavy duty, latex-free, and phthalate free vinyl. We also carry top quality wooden sports products by Lucio Londero, Italy." The Gymnic Line’s Rody Horse, Racin’ Rody Horse, Gyffy the Giraffe and Raffy the Rabbit are a favorite with children to learn balancing and coordination while hoping on their Rody. Used for therapy with special needs children due to its softness and ride-on qualities. Inflates according to size and weight of child (inflation by adult). Base is available for transforming to a Rocking Rody. For children ages 3 years and up, with adult supervision. The Gymnic Line’s NEW Rody Jr. is a favorite with children for imaginative and creative play, and is also a good friend for Horse and it is for children 6 years and up with adult supervision. Inflates according to size and weight of child (inflation by adult). Available in 2 colors. The Gymnic Line’s Hop Balls are the very best quality in hopping balls! Made of super strong, yet soft latex-free vinyl, for long lasting use and durability. Great exercise product for indoors and smooth safe outdoor surfaces. Promotes children’s body coordination, balance, lymph circulation and provides a fun workout while hopping on the ball. Inflates according to size and weight of child (inflation by adult). • NEW Raffy Rabbit – Lime and Pink your 18” doll. Made of heavy duty, latexfree vinyl, and is phthalate free. Is surface washable with soap and water. Rody Jr. is available in 3 colors (Light Yellow, Light Pink and Light Blue)! For ages 3 years and up, with adult supervision. 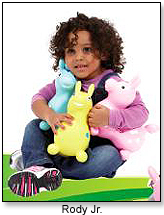 The Gymnic Line also has a Rody Max which is the same as the popular Rody. Rody - Pink by TMI TOYMARKETING INTERNATIONAL INC.
Made in Italy of high-quality latex-free vinyl, Rody is a classic riding toy that lets kids exercise while having fun. It's for children ages 3 and up, with adult supervision. 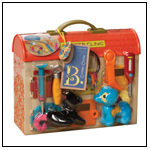 — “This is one of the best toys for a 2-year-old,” reported Valerie Elsea, owner of Jillie Beans Toys & More in Westminster, Colo., in spring 2010. She reported that Rodys were on the store’s best seller list, and had been since the store opened in November 2006. Gyffy the Giraffe by TMI TOYMARKETING INTERNATIONAL INC.
Made in Italy, the Gymnic Line's Gyffy the Giraffe is a favorite with children for learning balance and coordination while hopping. Made of heavy-duty, yet soft, latex-free vinyl, it inflates according to the size and weight of the child. Launch date: February 2009. — As of 7/21/2011 this product had 4.8 out of 5 stars from 5 reviews on Amazon.com. Rody Max by TMI TOYMARKETING INTERNATIONAL INC.
Made in Italy, Gymnic’s Rody Max is a favorite with children and adults. 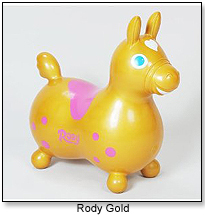 It is the same as our popular Rody Horse, but for kids and adults (ages 5 years and up). 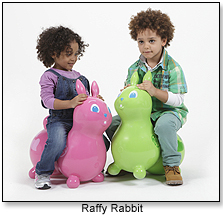 It is used to learn balancing and coordination while hopping on their Rody. Used in Therapy for special needs children due to its softness and ride-on qualities. Made of heavy duty, latex-free vinyl. Inflates according to size and weight of child. Is surface washable with soap and water. Rody Max is available in Orange, Red and Blue. Hop! 45 (18") by TMI TOYMARKETING INTERNATIONAL INC. This Hop Ball is the very best quality in hopping balls! Made from the super strong, yet soft latex-free vinyl material for long lasting use and durability. Great exercise product for indoors and smooth safe outoor surfaces. Promotes children's body coordination, balance, and lymph circulation. Special patented handgrip safety handle. Maximum sustainable weight up to 600 lbs based on the size of the ball. Rody Horse - Green by TMI TOYMARKETING INTERNATIONAL INC.